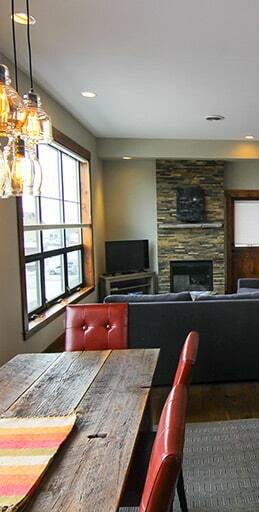 The Lion’s Lair is a 1300 square feet 2 bedroom, 2 full bathroom executive condo that sleeps 6 comfortably with views into Yellowstone National Park. The 10 feet high ceilings and tall, south facing windows fill the rustic-modern full kitchen, dining area and relaxing living room with lots of natural light. This new, spacious condo features a California King sized bed with a custom mattress in the Master Bedroom and adjoining Master Bathroom. The 2nd bedroom offers 2 extra long twin beds with custom mattresses that can be joined to create a King sized bed. The comfy living room also features a new, high-end Queen sized sleeper sofa. Some of the amenities you will love after a long day in Yellowstone are: wood floors, granite countertops, reclaimed wood furniture, private laundry, gas fireplace, full kitchen, HD flat screen tv, cable tv, air-conditioning, free wifi and definitely the custom mattresses. This unit offers tons of closet space too! On cool evenings relax and enjoy yourself around the gas fireplace and for amazing sunsets over Electric Peak enjoy a cocktail from your private deck. Join us on the main level at Wonderland Cafe for our delicious baked goods and unique fare along with your favorite beers and wines.